DAF Trucks constructs state-of-the-art transport vehicles that satisfy all modern requirements in terms of safety, performance and comfort. In order to automate the construction process, DAF Trucks involves FANUC robots for handling, bonding and spot welding. 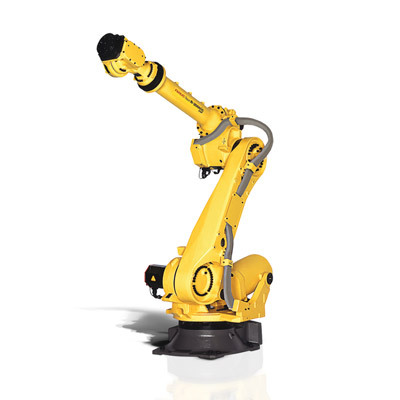 Continuous improvement on the level of automation due to the flexibility of FANUC robots. Additionally, the high product reliability proves to be successful as the first robot was acquired 25 years ago and is still fully operational. With the CF and XF series, DAF Trucks constructs state-of-the-art transport vehicles that satisfy all modern requirements in terms of safety, performance and comfort. Truck cabs are assembled in the DAF body factory in Westerlo – a highly automated process that involves the deployment of FANUC robots for handling, bonding and spot welding. The factory where the cabs are assembled consists of dozens of workstations, where various steps of the production process are carried out. The process differs from classic construction in the automotive industry and cycle times for trucks are a lot lower, so each station can carry out several operations. This has specific consequences for the robots, as they are deployed in a more flexible manner given that they have several tools available to them. For example, the rear panel of the XF cabs is assembled in a cell, where the robot has a docking station to swap its handling tool for a spot welding tool. This enables a single robot to position the components and secure them after visual inspection, and then a second robot in the cell helps with spot welding. As such, the method of automation for each cell is optimised in order for the required tasks to be completed within the predefined cycle time. The collaboration between DAF Trucks and FANUC dates back to 1991, when the first robot for bonding components was put into service. It should be noted that this robot, which has now celebrated its 25th anniversary, is still operational. It is used for bonding external components of doors, which cannot be done by spot welding, as traces of point welding would otherwise be visible on the outside. The programming of the bonding can be difficult to achieve. It is necessary for the robot to make allowances for the delay that occurs when starting and stopping the dispensing of adhesive. When a trajectory includes a curve or an angle, the robot must be sped up so that the quantity of adhesive applied remains constant. While most robots in the cab factory are deployed for spot welding, they also carry out a number of handling tasks. For example, nuts must be moulded onto the front panel. They have a sharp edge, which is flattened in the mould in order to secure the nuts to the panel. A FANUC R-2000iB fits the nuts and then holds the plate in position to mould the nuts. This process requires a tolerance of 0.5 mm, which is easily achieved by the robot. Subsequently, brackets have to be secured to the rear panel. These are manually inserted before the panel is brought into the production cell. A visual system in the cell checks if all the brackets are present before FANUC robots start spot welding. Three robots work simultaneously on the spot welding in the assembly cell for the XF cabs. To reach into the back of the cab, the M900iA has an extended arm. The process is made complete by two R-2000iB robots.